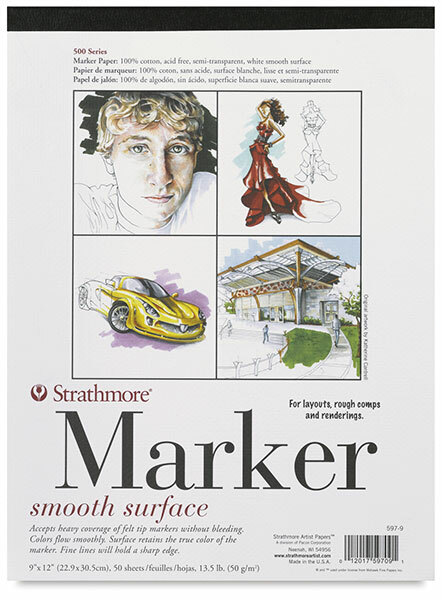 Ideal for designers and graphic artists, Strathmore 500 Series Marker Pads feature smooth-surfaced 100% cotton sheets that are semi-transparent/translucent yet accept heavy coverage of felt-tip markers without bleeding or feathering. The paper's white color guarantees optimal reflection of marker colors. Excellent for layouts, rough comps, renderings, building colors, and blending tones, it's also a visualizing drawing paper that works well with pencil, charcoal, pastels, and pen-and-ink. Acid-free. Paper is 13.5 lb weight (50 gsm). Tape bound pads contain 50 sheets.